Follow the steps below to install Telerik RadEditor for MOSS on your SharePoint 2007 farm. Extract the contents of RadEditorMOSS_5_x_x_Dev.zip or (RadEditorMOSS_5_x_x_Trial.zip - if you are using the trial version) to a folder of your choice on the MOSS server. 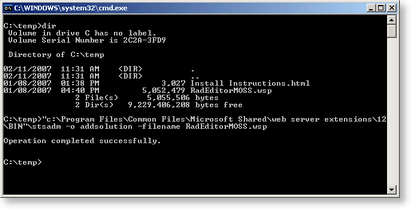 Run the stsadm.exe utility to install RadEditorMOSSsolution. By default stsadm.exe can be found in [Program Files]\Common Files\Microsoft Shared\web server extensions\12\BIN. 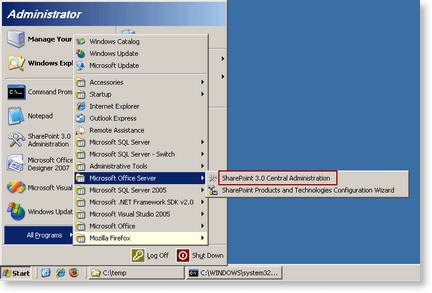 Open the SharePoint Central Administration page. 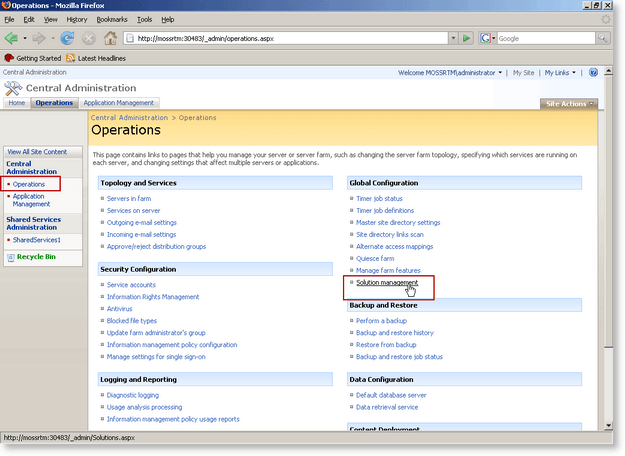 Go to the Operations page and click on Solution Management. You should see the radeditormoss.wsp solution in the list. Click on the name link to go to the Solution Properties page. 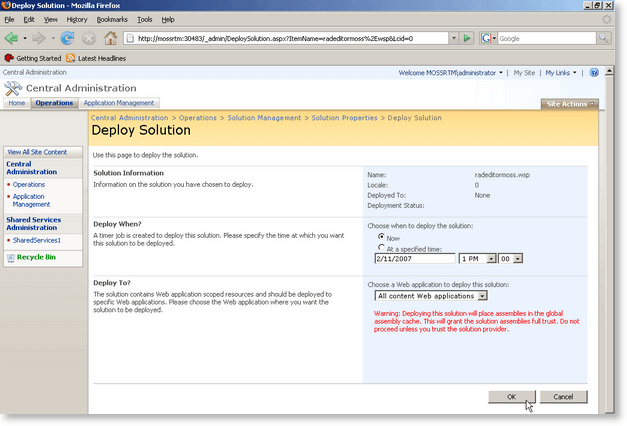 From the next page you can choose when and to which applications to deploy the solution. If you see the following exception - "Request for permission of type..." when you try to open a page containing the editor, then you might need to modify the web.config of your SharePoint application and set the Trust level to at least Medium level. This can happen if you choose to deploy the editor solution to a single site (in the BIN folder) instead of to all sites (in the GAC).